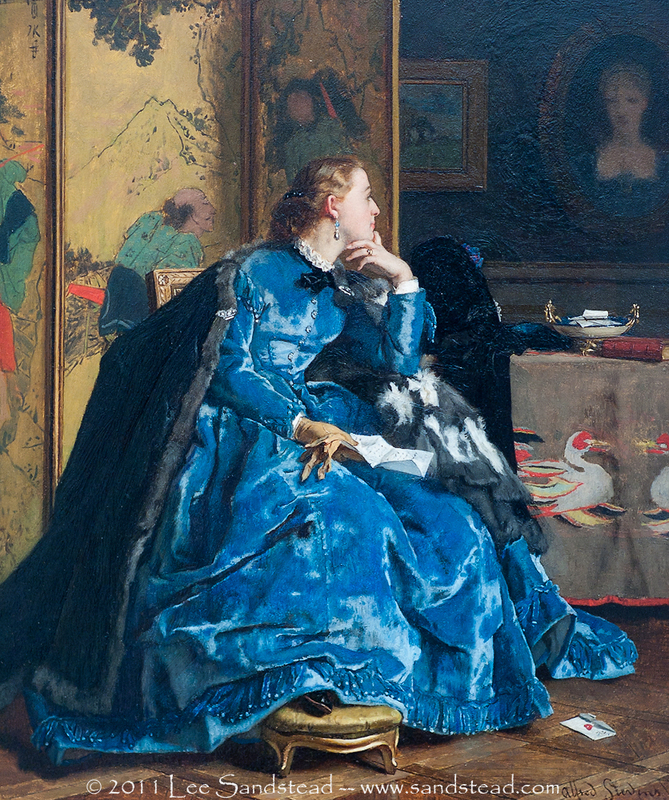 'The Duchess' (or 'The Blue Dress') by Alfred Stevens, 1865-1867. Sterling and Francine Clark Art Institue, Williamstown, Massachusetts. The opening of Japan to the West in 1853 after years of nearly complete isolation, created the cultural phenomenon referred to as 'Japonisme'. it describes the European fascination with Japanese objects and culture that previous to this had only been available for two hundred years to a few Dutch trading ships. Alfred Stevens (1823-1906) was one of the first painters to become interested in the Asian artifacts and arts that began to be imported into Paris in the early 1860s. 'The Duchess' shows an expensively dressed married woman of high society who has just returned home; she is still wearing one glove. An opened letter rests on her knees while she looks at a dim portrait (her younger self? a lost relative?). From under her dress one tiny foot is visible. The receiving of letters theme is reminiscent of the work of Vermeer﻿. Great painting! I like the Japanese items, it makes it unique. So Rob, is the artist any relation to you? Not to my knowledge. My ancestors were cheese makers in Edam!